Here are some REAL comments and reviews about the Kavouras bet. 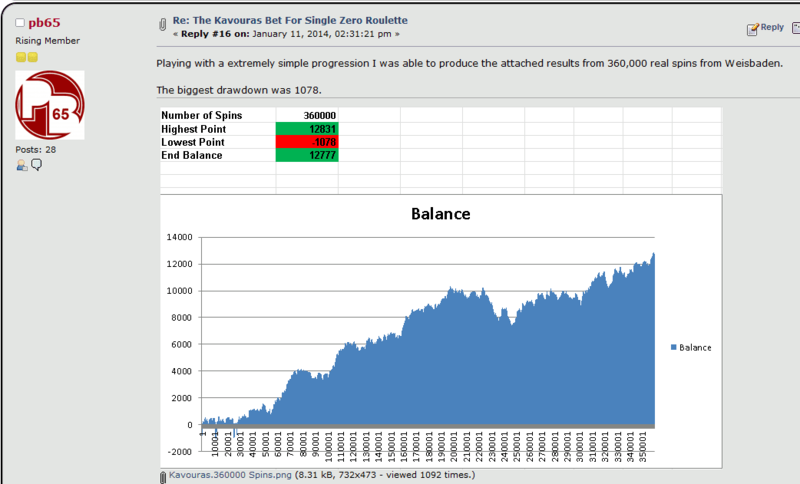 The interest in the Kavouras strategy is so impressive that the topic Kavouras bet will soon reach 15,000 views, the topic My First Games With The Kavouras Betting System has exceeded 50,000 views and the original post of the bet selection has over 100,000 visits so far. How the overall strategy attacks multiple ways at once, simultaneously attacking multiple targets -- by this I mean such targets as variance, casino cheating via wheel/dealer, wheel bias, possible metaphysical issues concerning a session. What affects me most deeply is how the physical wheel actually spins while a person is gone. The importance of expectation to determine the "season status" of the wheel. Thanks in advance for your patience as I take a brief moment to define some basic terminology and concepts about betting systems in general. This will help me to better describe my thoughts concerning the Kavouras Bet in a coherent manner as we continue. All attempts to win at roulette begin with a system, which is simply a betting framework by which we try and improve our odds so that we can win more frequently than would normally be expected. Any improvement that we gain is called an "edge". The foundation of every system is the bet selection. It is the key to whether a system will fail or succeed because eventually even the best system will need to attack the wheel to maintain/gain profitability. Although they may appear simple and basic, it is very difficult to strike an advantageous balance among the features listed above. The first amazing thing I have realized about the Kavouras betting system is that the Coverage is 20 numbers with a Cost of only 8 units; this dramatically lowers the expense of future attacks, both through chances of losing and actual chip costs. Coverage is taken into account with every spin of the wheel and the Kavouras Bet provides a very healthy 54% chance of a non-loss, every time. This also gives rise to a favorable phenomenon which I call the Kavouras Wave, where multiple successive wins occur that create "natural" profit, with no raising required. When Kavouras Waves are active, you are invulnerable to any negativity from the wheel. Kavouras waves can be worth hundreds of units and can obtain new profit, as well as recover lost profit. Its always quite thrilling to experience a Kavouras Wave! What I have found even more incredible is that the “target” Payout is 2 units more than the Loss; this is very difficult to achieve in system design and especially when the Cost is kept low, as with the Kav. This advantage may appear small but it has a cumulative effect that is not necessarily easy to gauge and should be kept in mind. It should also be noted that since the “target” Payout is a very healthy 10 units (this is actual net profit, not gross), on attack it pays extremely well. These of course are the corner and double street. They actually pay a net profit (+1 or +4) which is truly amazing taking into account all the other advantageous features already in place. In fact, it is impossible to fully understand the tremendous and hidden value of this feature without actually studying and playing the Kavouras Bet but more about this later. The favorable foundation of the Kavouras Betting system is so very incredibly rare but its greatest secrets are hidden! 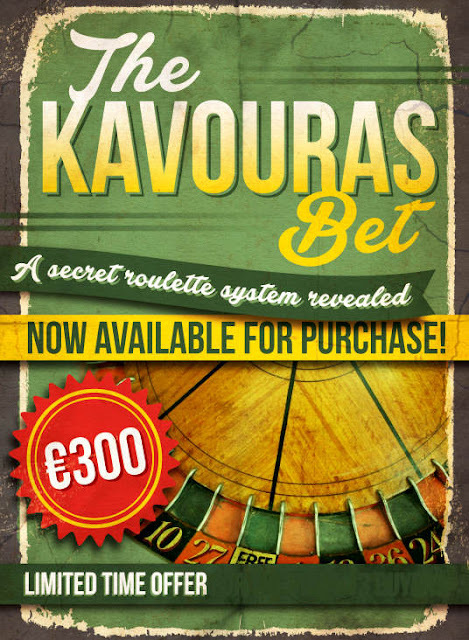 It has been said that the Kavouras Bet is a secret betting system which certainly intrigued me when I first encountered it. After briefly studying the Kav, I put it into a simulator and found that it does nothing but consistently lose. "And for the most part the relative value of our bet on these numbers is constant. However there are instances where we need to... be flexible and change the amount of our bets..."
The key to and focus of the Kavouras Bet is the 5 splits and making them pay as inside betting numbers. The following important and related point will help to elucidate the tremendous value of this key focus. The corner and double street pay +1 and +4 respectively, whereas a miss deducts 8. A pit boss will look at this system and instantly know that it "loses" because of this inequality; eventually the -8's will hit more often than the splits and the corner and double streets will not pay enough to recover the loss. However, the advantage is yours when the pit boss thinks it loses because you are free to win the amount of chips that you wish! The apparent "weakness" of the corner and double street is actually the Kav's greatest hidden strength because the Kavouras Bet is not about playing 20 numbers successfully as it appears. It's about playing 10 numbers successfully and making them pay! The corner and double street "catch" the split misses (while paying a net profit) which give the splits a 55% advantage which is the equivalent of 18 numbers. The splits are empowered by the corner and double street and I call them "The Golden Hammer" because they pay so well and so frequently (due to the added help of the corner and double street). It's like playing black or red but getting paid 10 times the profit! Despite these advantages, I am always amazed at how the computer/spreadhsheet/pit boss tell you that the corner and double street are exactly the reason why it loses! Combining this understanding within a trigger system and raising schedule will actualize all of the previously mentioned advantages, which then reverse the results as shown in simulators and the expected results from standard (i.e. unaltered) play. The true wisdom of the Kavouras Betting System is so deeply hidden that it can only be understood through concentrated study and play. It cannot be "understood" by a computer or a spreadsheet. It is wisdom that is deeply rooted in the reality of statistical events. The statistical advantage of the Kav is not fully realized without conscious intention to actualize that advantage which is something that neither a spreadsheet nor a computer can even understand, much less actually accomplish. When WE the conscious operators of the Kav system need an advantage in order to be profitable, when we need something we can rely upon, The Kavouras Betting System is there for us! Every time I spin that wheel, I know I have the statistical advantage and when I decide to apply force to accomplish my will, I do so with the statistical edge! 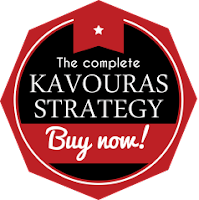 I can only recommend that you start studying and playing the Kavouras Bet and learn to reap its great rewards for yourself. I have found it a very profitable way to enjoy playing roulette and I am sure you will too! 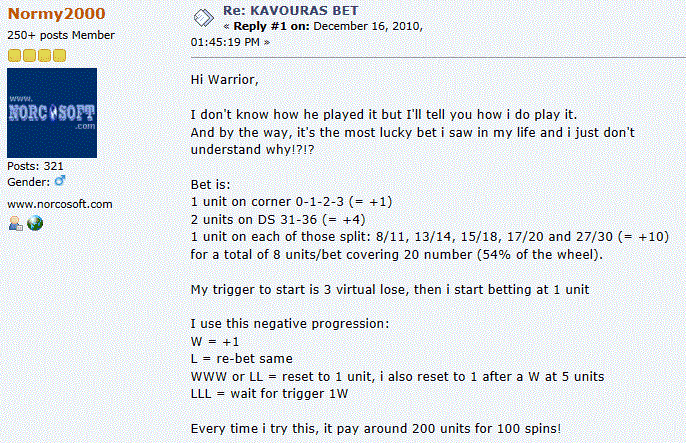 I can only recommend that you study and play the Kavouras Bet and learn to reap its great rewards for yourself. I have found it a very profitable way to enjoy playing roulette and I am sure you will too! When I read the description of the full Kavouras Bet which includes the trigger identification, the betting schedule, the debt management method AND the alternative bets, I knew it was worth my money. After struggling very hard for a period of months and over 20,000 spins, I can say that, in my opinion, these rules (when to bet, how much to bet & when to stop betting) are worth as much as if they were printed on gold bars. In a way, they are what separates a professional player from an amateur gambler." I wanted to play roulette with a profit, that’s why I was intrigued by the Kavouras Betting System and I can only recommend it to anyone who wants to learn how to successfully attack the wheel. Thanks for reading and may your preparation meet with opportunity! I am back playing the Kav again and its a strong earner! The bet selection is almost magical and I am very certain that it is the key to its success. Its amazing how it dissects the spin sequences examining the results of each spin with a magnifying glass but also at the same time engages in spin "flow" despite the intense focus. I have alot of studying to do in relation to the recovery system but I still remember to watch like a hawk for any "red flag" signals to take profits "slightly earlier" than the book amounts. I remember that the default is NOT take early profits as the splits come back with the "chip flow" & bet selection helping it to happen. One of the great things about it is how low the required bank balance is at 1600 units to encompass the entire recovery system.